Struggling with acne? You are far from alone. 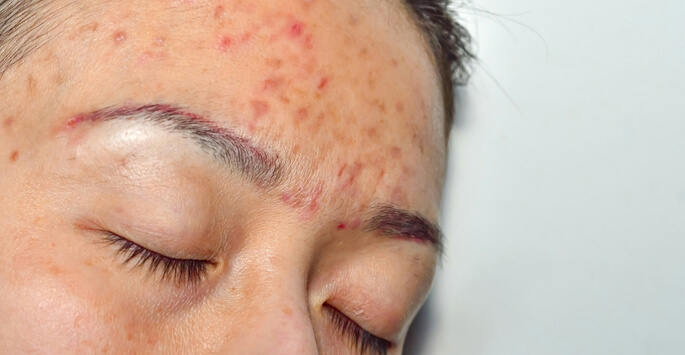 Many people believe their acne will simply disappear on its own when they reach adulthood and are disappointed to discover that is not the case. There are many acne treatments out there, which can make it hard to know what is best for you. Chemical peels can be highly-effective at not only treating acne, but also revealing fresh, glowing skin. Chemical peels are a method of rapidly and dramatically exfoliating the skin. This removes the oil and dead skin cells that can clog pores and lead to breakouts. There are different “levels” of chemical peels available, and they do not all use the same ingredients. For acne treatments, a superficial peel is often enough. The nice thing about these peels is that they can be done during a break from your other activities. They can be highly-effective when it comes to clearing up acne. Step one is to thoroughly clean and then dry your skin. Next, whichever exfoliating agent that has been chosen for you is applied. You may feel your skin getting warm while the exfoliation happens. This is normal and to be expected. Exactly how long the peel is left on your face can vary, but is typically just minutes. When the time is up, the solution can be washed off. Your skin may look a bit sunburned after your treatment. Makeup can be used to conceal any redness. While the chemical peel will do a lot for your skin, it should not be the only piece in your acne-fighting puzzle. You will want to continue to use or develop a home acne treatment regimen. Be sure to wear plenty of sunscreen when you go outside. Find an option that will not clog your pores. In the days after your peel, your skin will be extra sensitive. Avoid using any facial cleansers that contain ingredients that can sting. You will want to continue to wash your face, just with a gentler cleanser. You can learn more about chemical peels and our other available acne treatments when you visit us at Pinnacle Dermatology for a consultation. Our office is located right here in Birmingham, AL. Contact us today to book an appointment and get started!